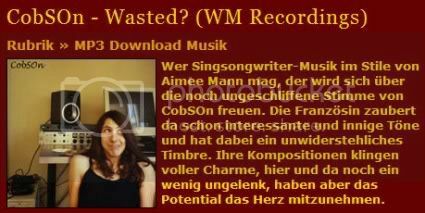 Phlow.net has published a nice review of CobSOn's Wasted? Full review here. Free Albums Galore has reviewed the album by Century of Aeroplanes. An excerpt: "Considering the myriad tonal colors and instrumentations, it is impressive how well-balanced and consistant this album is. If Century of Aeroplanes purpose is to remove us from our depression alliance stress-filled lives to a temporary musical paradise, they have succeeded admirably." Splendid Magazine has posted a rather funny review of Roy "Chicky" Arad's Sputnik in love:Sputnik In Love's title track is a two-chord ditty with cheesy, poorly recorded drum machine beats and arrhythmic acoustic guitar. The lyrics repeat the song title, almost to the point of causing physical pain. Arad eventually launches into a bridge whose infantile lyrics could well injure you mentally: "I don't know if you love me / I don't know if you care / I don't know if you're sick of me / I don't know if you're there. "Read the full review here. Our release of Roy "Chicky" Arad's Sputnik in love is getting a lot of attention in Roy's homeland Israel. See the latest review here.